I do not accept that the Edda of Snorri Sturluson is a true reflection of our faith and religion. As a member of the family of clans of Northern Europe, he was in possession of the truth of our faith, but he chose to dishonour himself by distorting that truth and betraying our Gods and his own kindred. He was an ambitious man who had friends in high places among the clergy of the new religion of Christianity and chose to ingratiate himself with them by his assistance in their attempts to wipe out our faith. When the Christian recorders of our religion translated our poetic epics from their Runic and spoken forms into Latin, which was the language of their faith and literature, many of our words and phrases were unknown to them and had no Latin equivalent. What they could not understand they altered to fit their own creed, what they could not accept as truth they distorted or ignored. The important factor they failed to recognise was that our faith was not only recorded in written form in the Runic poems, but was in the main passed on from generation to generation by word of mouth. They failed to take into account the deep and extensive memories of the Northern European folk, honed to perfection by the ability and the necessity of the oral tradition, not only in remembering and recounting the mythos of our religion, but the ability to remember and recite the generations of ancestry back to the ‘Dawn Time’, the beginnings of our folk. What they failed to realise was that our faith is a living truth which was, and still is, deep in the minds, hearts and souls of our folk. It was when this fact was realised that the exterminating began, as Stalin attempted more recently in Russia, a systematic elimination of anyone or anything that would contradict their version of our faith. 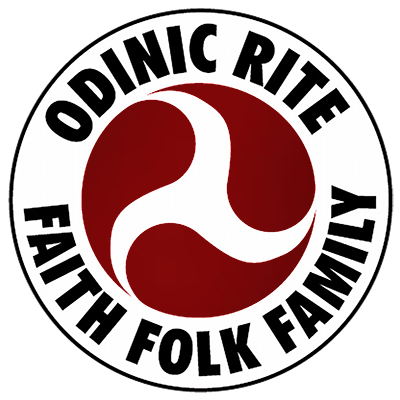 Countless thousands of our folk, here and in Europe, died horrific and bizarre deaths at the hands of the Christian priests in the name of their ‘prince’ of peace, a title which has a hollow ring to Odinists, as it does to many peoples of this planet. When those methods failed to kill off our religion, they began the task of re-writing their own ‘holy’ books – they thought that, as only the clerics and priests of their church were allowed to, or in fact could, read these books, that the alterations would be accepted. All would think they were the ‘word of God’. They taught that our Gods were demons, and that those who worshipped and loved them were evil, damned for eternity. Thus they excused the genocidal tendencies of their church and the mutilation and murder of those who were not of their religion. Still our faith survived, our living Gods never left us, their stories, myths and truths lived on in our fairy-tales, folklore and legends, deep in the memories, hearts and souls of our folk. Their qualities lived on in our musicians, writers, inventors, explorers, soldiers, and in our seekers after truth and learning, all of these activities frowned upon by the Christian clerics closeted on their knees with their cross and their ‘bible’. That truth cannot be killed or hidden forever is a lesson that propagandists throughout history have had to learn – that all of the evidence cannot be eradicated, and somehow, sometime, the truth will emerge. Those who lie and distort the truth have always, at some time or other, been exposed and their lies invalidated as a result. Our faith is a living, visual, truth, and the peoples of Northern Europe who espoused it, far from the barbaric bandits the Christian propagandists told of, were a deeply cultured, courageous and intelligent race, as recent archaeological evidence has disclosed. Our religion is a way of life, a celebration of life, which respects and reveres all life and is an inspiration to our folk, as opposed to the Christian way, which glorifies death and the ‘next life’, teaching its followers that nature and this world are unimportant, that anything that brings pleasure is sinful, that they should be humble, meek, submissive to control, and that they should practice the cannibalistic ritual of the ‘last supper’. Those of us who have returned to the faith of our ancestors are living proof that our Gods exist and are very much alive and with us. We find in them our inspiration and our courage, our wisdom and our eloquence, and in return we give them our loyalty, our thanks, and our eternal love. We defend their honour and truth. Even though the dying Christian creed and its adherents may persecute and vilify us, we are part of the eternal truth and its return, and our spirits are protected, sacred and holy.